Each year when it comes time to put together our Top Physicians issue, I have the opportunity to speak with numerous doctors from across South Jersey. And no matter their specialty, they all speak with the same intense passion when it comes to their patients. The word I hear a lot is “family,” as in the relationship they share with those they care for. And it makes sense; they know you intimately, see you regularly, and think about you frequently. What you hold in your hands is our biggest Top Physicians issue ever, featuring 488 area doctors all recognized for their outstanding achievements in a tough profession. We once again partnered with the independent organization Avvo on this year’s list, as well as included hundreds more selections by our loyal readers. Thirty of these top docs took the time to answer questions with regard to the future of the industry, what they find rewarding about the profession, and the things they don’t teach you in medical school. Their responses were both candid and interesting. In keeping with the medical theme, we spoke to local residents and health care providers alike to get their take on the new Affordable Care Act—a hotly contested piece of legislation that has caused plenty of debate across the country. While there may still be some confusion about the law moving forward, there is certainly no shortage of opinions. Despite the Phillies down season, South Jersey baseball fans have still had plenty of reasons to cheer this year. That’s because Millville’s Mike Trout has skyrocketed to stardom as one of the game’s brightest rising talents. To date, the Los Angeles Angel is a shoe-in for American League Rookie of the Year, a potential MVP candidate, and a first-time All Star. What’s even more remarkable? He turns 21 this month. 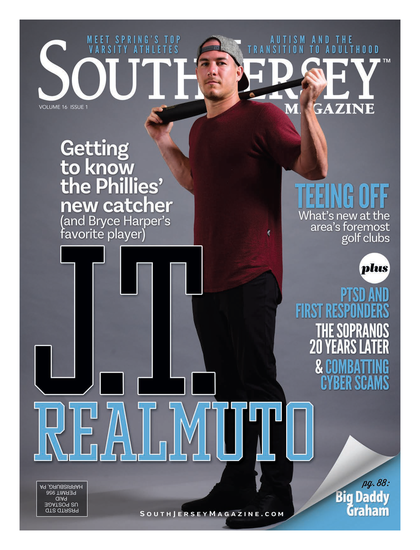 Arguably the biggest athlete to come out of South Jersey in quite some time, Trout has captivated his hometown (the mayor tells us he sees just as much Angels red as Phillies red these days) and the national audience as well. Check out our story on Page 102 to catch a glimpse into his whirlwind season, and see how the young phenom has remained grounded through it all. Much like the way he plays the game, his maturity is well beyond his years.